Lawrence Joseph Henderson was born on June 3, 1878 in Lynn, Massechusets. His father Joseph was a businessman. Henderson went from being an undersized infant to an athlete who was known for his running speed. Henderson attended school in Salem, Massachusetts and entered Harvard College at the age of 16. He was fond of mathematics and physics and did well in those subjects. He earned his A.B. degree in 1898 and entered Harvard Medical School later that year. He earned his MD in 1902 and afterwards spent two years working in Franz Hofmeister's laboratory at the University of Strasbourg. When he returned to the United States he took a lecturer position at Harvard Medical School. He would remain at Harvard for the rest of his career, as an instructor from 1905-1910, as an assistant professor of biological chemistry from 1910-1919, as a professor from 1919-1934 and as the Abbot and James Lawrence professor of biological chemistry from 1934 until his death. Henderson's initial research interest upon returning to America was in understanding buffer systems and how the human body maintains its pH balance. In the blood carbon dioxide from cellular respiration combines with water to form carbonic acid. Carbonic acid (H2CO3) exists in the blood primarily in the form of bicarbonate (HCO3-). Bicarbonate and the proteins of the blood act as buffers that maintain the body's pH. When excess acid or base is produced bicarbonate acts to maintain the body's pH at a slightly basic pH (about 7.35). From his research on buffers Henderson developed an equation that can be used to calculate the pH of a buffer system. The Henderson/Hasselbalch equation equates the pH to the pKa of the acid in the buffer plus the log of the concentration of the acid's anion divided by the concentration of the associated acid (pH = pKa + log([A-]/[HA]). 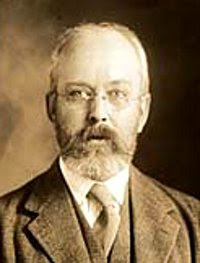 Henderson's later research career dealt with more philosophical issues in science. He published two books, The Fitness of the Environment and The Order of Nature, devoted to the discussion of global problems of the fitness of organisms in their environments. In The Order of Nature he concluded that "the whole evolutionary process, both cosmic and organic, is one, and the biologist may rightly regard the universe, in its essence as biocentric." Henderson died on February 10, 1942 in Cambridge, Massachusetts.